Designed solely for drum reeling applications. From dockside cranes to automated conveyor systems, these cables can cope with incredible workloads. Suitable for outdoor installation since these cables are UV and weather resistant. Special low temperature type to work down under -40°C & other sizes with high tensile versions using Kevlar strain relief elements are also available. Fine copper wire strands to IEC 60228. 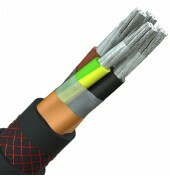 Rubber insulation, 4 & 5-core colour coded, six core and above, black with white numbers. Green/yellow earth core in all cables. Cores twisted together with short lay length. Black neoprene (PCP) dual layer outer sheath with integral textile braid.